From there on it seems to be a slippery slope of self-serving, back-scratching decisions that become less about the real people the higher you climb. Because of course, who funds your campaigns and powers the votes that send you each step further up the ladder? It's not the masses that you serve, it's the minority with the money. So bit by bit you serve the people a little less, and bow to the money a little more - before lo and behold, your soul is now owned by corporate monsters who's only agenda is more money and more power for themselves. You're just the puppet to help them get it. The best politicians are the ones who don't want the power, who don't want the limelight - they just want to make things better and serve their communities. Just a shame then that few of those people will ever rise high enough to make a difference on anything but a local level. It's a twisted system, but it's the only one we've got I guess. 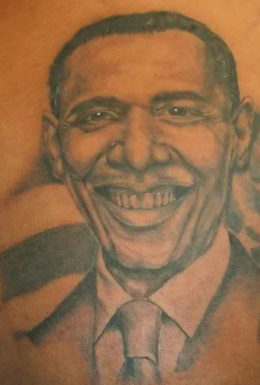 Both President Obama and his wife promised their daughters that if they ever got tattoos then he and his wife would get tattoos too! It's true - it was reported in the Washington Post here. But maybe this one backfired a little, after daughter Natasha got a small one of her father right over her heart. Wife Michele is not too impressed with either of them however, as the agreement was that she too would get the same tattoo. I think Michele would much rather both of them got their tattoos removed (after all, laser removal is very effective these days). Which kicked off a bit of 'boys will be boys' competitiveness. It's understood that some of the team were then shown the tattoo, which is where the photograph of it originated. 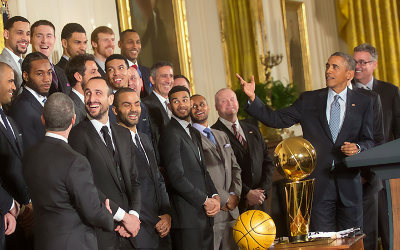 Barack allowed the picture only on the understanding that at least 3 members of the team agreed to get a similar tattoo of Barack done themselves. The chosen San Antonio team members would not be allowed to remove the tattoo for at least one more presidential term! It remains to be seen if they have followed through on the promise.